This tour is currently full. Please contact us if you are interested in being put on a waiting list. There is no cost or commitment to do so. September 10 - 21, 2018 - Full! September 10: Overnight Flights which departed US (day before) arrive in Keflavik. Transport by taxi or bus to City Center of Reykjavik. Check-in to hotel and meet Rod at 4:30 PM for orientation and meet other participants. September 11 and 12: After a leisurely breakfast we'll make our way deeper into the Interior of Iceland. 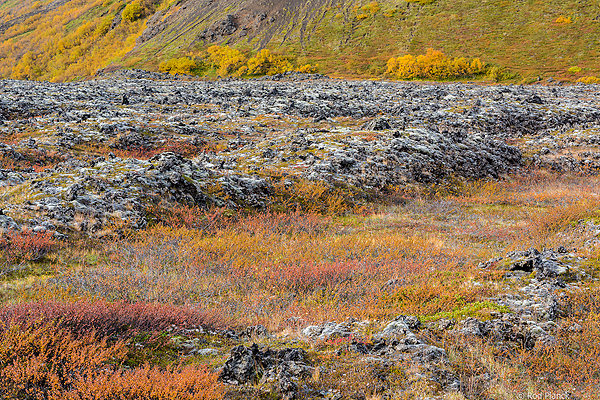 Over the next two days we'll travel in and around Landmannalaugar, part of the Fjallabak Nature Reserve, where we will see mountains composed of rhyolite rock of varying delicate colors. This is an area of indescribable splendor, featuring hills awash in a painter's palette of reds, bright yellows and greens. 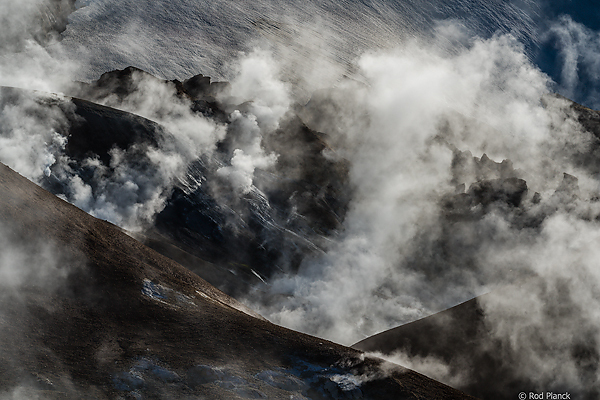 Landmannalaugar is a land born of hot springs, with steam rising from every corner of the valley. 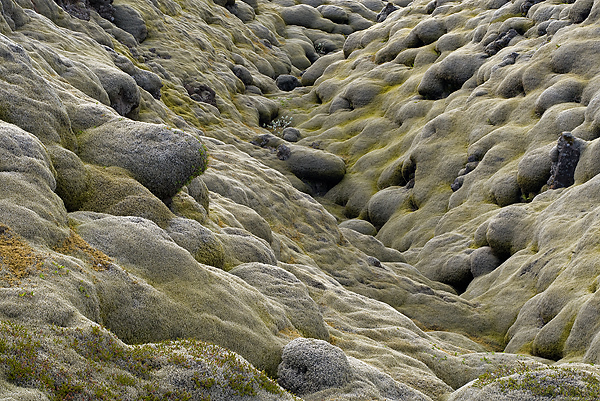 In addition, we'll also photograph in the volcanic district of the Veidivotn fissure. This fissure is one of Iceland's youngest fissures, created during the 1480 eruption and features lava formations and craters. In calm weather, a multitude of small pools and lakes capture reflections from the dramatic geologic formations. September 13: As we begin our journey for the day, we'll stop along the way to photograph the legendary Gullfoss. Continuing north into the Central Highlands one of Iceland's most remote areas where we'll discover glaciers, volcanic desserts and numerous hot spring areas near the Kerlingarfjoll Mountains (women's mountains.) 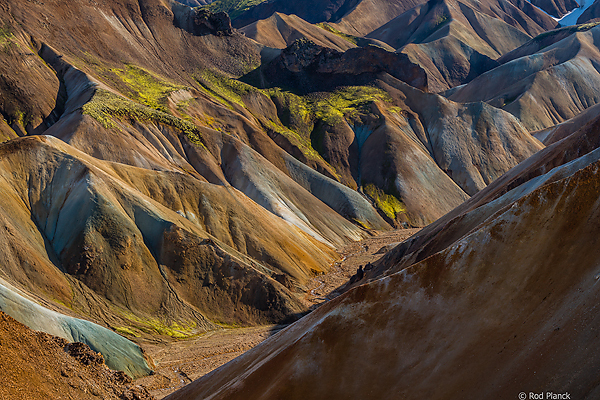 The Kerlingarfjöll highlands offer amazing rhyolite colored formations similar to Landmannalaugar. September 14 and 15: Continuing our journey north, we'll pass through northern Iceland's largest town, Akureyri, stopping at Godafoss waterfall (Waterfall of the Gods). In and around the Lake Myvatn region are many things to photograph including the Kálfastrandavogar lava rocks jutting out of the lake, Jökulsárgljufur Gorge National Park and Dettifoss (most powerful waterfall in Europe.) 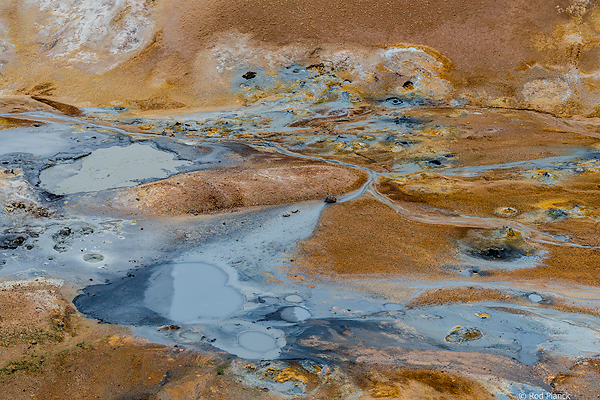 The rest of the day will be spent photographing around the Lake Myvatn area and the multi-colored geothermal areas at Hverarond. September 16: We will travel from the Lake Myvatn area over the Breidalsheidi pass then through the Mödrudalur valley stopping along the way to photograph the old 19th century farm, Saenautasel. 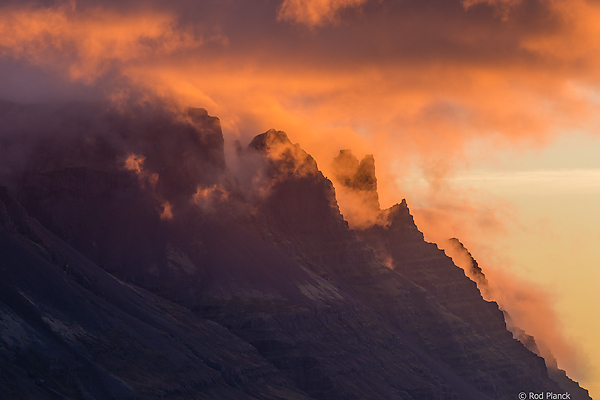 We'll continue on to the East fjords of Iceland. The east coast features long, narrow fjords with steep sides and jagged mountain peaks as well as picturesque fishing villages. We will continue south and make stops at several locations along the east coast until we get to our overnight location near the hamlet of Breiddalsvik. Here we will be situated well away from city lights and will take advantage of opportunities to photograph northern lights if presented. September 17: Continuing south and stopping along the way to photograph autumn landscapes and whatever presents itself. After checking in to our next location we'll drive to the Jokulsarlon Iceberg Lagoon and spend plenty of time there. We'll also take advantage of this time to photograph "diamonds" on the beach. These are icebergs (ranging in size from basketballs to trucks) which have escaped the lagoon only to be washed up on the black sand beach of Breidamerkursandur. In the evening, we'll most likely return to the glacier lagoon or go to another "secret" place that Rod knows about to photograph ice held captive in a lagoon and hopefully northern lights glowing in the background. September 18: The southeast is overshadowed by the vast Vatnajokull icecap, whose enormous glaciers creep down through every crack in the coastal mountains. The highlights of the region are the areas in and around the Skaftafell National Park. 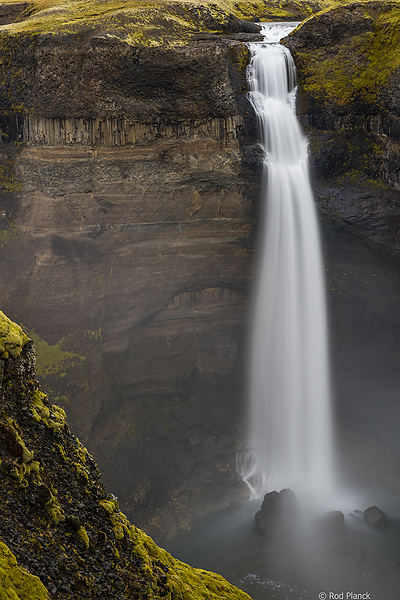 Including the accessible Svinafellsjökul glacier, Svartifoss, and the Fjadrargljufur canyon. September 19: Today using the Oldufell route we'll explore the southern district of the highlands and surrounding countryside and photograph a variety of landscapes, beautiful streams and waterfalls, churches and Icelandic horses (if accessible.) In the evening, after another wonderful dinner, if we are lucky, we'll be able to step out the backdoor and photograph sunset and possibly northern lights. September 20: This day we will let the weather dictate what we do. Possibilities are numerous: driving over the black sands of Mýdalssandur towards the Hjörleifshöfdi cape to photograph rock outcroppings, drive on top of cape Dyrhólaey, the southernmost point of Iceland or go an entirely different direction and take the Fjallabak Route to the backside of the Myrdalsjokull glacier to photograph volcanic landscapes and green moss covered mountains. As we make our way back towards Reykjavik, if time allows, we'll stop at the impressive Skogafoss. September 21: Prepare for the journey home. If time allows you can explore the museums, sightsee or check out one of Europe's famous shopping districts in downtown Reykjavik. Allow at least one hour to take a bus or taxi to the airport. $9500 (Single Occupancy) (Includes several VAT increases Effective 1/1/15) (Deduct $200 p/p for double occupancy - we cannot guarantee availability of another participant who is willing to share a room). Please budget for single occupancy. Note: Price based on current estimates of costs. If rates increase radically we reserve the right to increase the cost of the tour. You will be notified and given the option to opt out if unaccepatable. 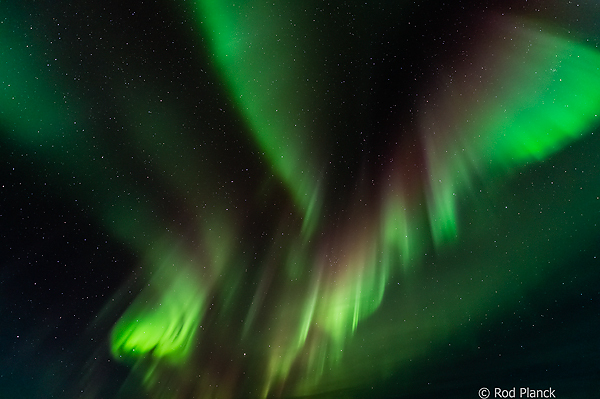 Rod Planck ~ English Speaking Guide and Professional Photographer will act as the tour leader. You'll photograph alongside Rod who Nikon USA designated as a "Legend Behind the Lens" and in 2002, was heralded by Outdoor Photographer as one of the top five "Master's of the Landscape." 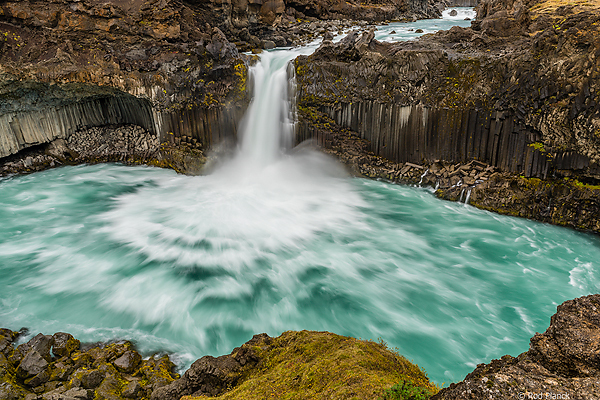 Through numerous tours around the world and Iceland Rod's knowledge of the area and instincts as a photographer will assure the trip will be a photographic success. "Hawk", born and raised in Iceland, will act as our driver/guide. He is one of the most respected photographers in Iceland who also owns one of the largest stock photo agencies in Iceland. His intimate knowledge of Iceland, passion for the land, and knowledge of photography makes him an excellent choice for the tour. He understands the vagaries of light and its impact on photography, our need to keep unusual hours, and most importantly, he knows what makes photographers tick. As with all things in nature, there can be no guarantees. This time of year is known for higher likelihood of the natural phenomena known as northern lights or aurora borealis but we cannot guarantee that this will happen during the tour. All accommodations are hotels or guesthouses with "best available" within reason selected. In all instances, with few exceptions, rooms will have private baths and single occupancy. * Please refer to itinerary to see what is included each day. When comparing our tour to others please take into consideration that rooms are single occupancy, private bath (when available) and also includes the first and last night of the tour while in Reykjavik. Most tours do not. We'll get around in a 4x4 designed for just the type of travel we will be doing. This mode of travel also allows us the flexibility of crossing rivers in the back country and comes highly recommended by Hawk, who is experienced with photographic tours. Initial deposit: $1000. Second deposit: $4250 is due on January 1, 2018. Final payment: $4250 is due June 1, 2018. (Double Occupancy - deduct $200 from final installment.) After January 30, 2018 and until 120 days or more prior to departure, payments are refundable except for $2000. Refunds given 119-80 days prior to departure will be subjected to a charge of 40% of the tour price, 79-60 days prior to departure, a charge of 60%, and 60 days or less prior to departure No refund will be paid. We are not an insurance company - please protect your travel investment - buy trip insurance! In the event that we cancel the trip, all monies paid to us will be refunded. However, we will not reimburse for unused airline tickets. Please purchase trip insurance. Breakfast, Lunch and Dinner (BLD) are included most days please see above daily listings. This will permit you to make your own selection of the restaurants in Reykjavik. Tour cost does not include air transportation, airport departure taxes, airport transfers, personal items such as laundry, wine, liquor, meals not included in itinerary, beverages not included with meals, medical expenses, faxes/telephone/email charges and insurance. Nor activities listed as optional, or those taken on your own; passport/visa expenses; personal medical or travel insurance. Estimated flight cost from US (JFK or BOSTON) to Keflavik, Iceland $1200 (coach). At this time, Delta and Icelandair have flights to and from Iceland. Rod Planck Photography, McMillan, Michigan act only as agents and shall not be responsible or become liable for any delay incurred by any person in connection with any means of transportation, nor for the loss, damage, or injury to person or property by reason of any event beyond the control of the agency or default of such agency suppliers. We reserve the right to cancel the tour prior to departure in which case full refund will constitute full settlement to the passenger. No refund will be made for any unused portion of the tour unless arrangements are made at the time of booking. All rates are based on current tariffs, exchange rates and fuel costs and are subject to adjustment in the event of any change therein. We reserve the right to change the itinerary if we deem by doing so we provide a better experience for participants. You will be notified in advance if a change is made. By sending your initial deposit, you agree to accept our payment schedule as a contract. If payments are still outstanding two weeks after the due date, your space may be forfeited. Baggage is at the owner's risk. Travel to remote places like Iceland is exciting, but understanding and accepting the risks, both medical and logistical, are important. There are clinics where minor medical problems can be treated, but due to the remoteness of most of our itinerary, there can be no expectation for immediate medical attention. If this fact concerns you too much, do not choose this trip for your vacation. Anyone with health problems needing close medical supervision should not consider going on this trip. Bring enough medication for the duration of the trip for any chronic medical needs. When you send your tour deposit and signed reservation form, you certify to us that you do not knowingly have any physical or other conditions that would create a risk for yourself or for other trip participants. Trip insurance information is available from us and will be sent with in-depth trip information and your deposit receipt at the time of making your reservation. It is your responsibility to obtain trip insurance and is strongly advised due the changing nature of the location and cost of the trip. Please understand that we are not an insurance company, please protect your travel investment and buy travel insurance. Cost of the Tour: $9250 includes accommodations (double occupancy), land transportation (except individual transfers), entrance fees and meals (breakfast, lunch and dinner - except where noted). $9500 includes accommodations (single occupancy), land transportation (except individual transfers), entrance fees and meals (breakfast, lunch and dinner - except where noted) and VAT increase effective 1/1/15. (Deduct $200 for double occupancy - we cannot guarantee availability of another participant who is willing to share a room). Please budget for single occupancy. Initial deposit: $1000. Second deposit: $4250 is due on January 1, 2018. Final payment: $4250 is due June 1, 2018. (Double Occupancy - deduct $200 pp from final installment.) After January 30, 2018 and until 120 days or more prior to departure, payments are refundable except for $2000. Refunds given 119-80 days prior to departure will be subjected to a charge of 40% of the tour price, 79-60 days prior to departure, a charge of 60%, and 60 days or less prior to departure No refund will be paid. We are not an insurance company - please protect your travel investment - buy trip insurance! In the event that we cancel the trip, all monies paid to us will be refunded. However, we will not reimburse for unused airline tickets. Please purchase trip insurance. You can register online using PayPal by clicking the "Add to Cart" button below. You do not need a PayPal account to use a credit card for the initial deposit. By Phone: Call (906) 293-3339. Office hours are Monday through Friday, 9a.m. to 5p.m. EST. For reservations made by phone, we accept credit cards (for deposits only), or we'll hold your space for 7 days, while awaiting your check.